Voll im Trend – BIPV-Lösungen sind immer mehr gefragt! Der Anteil erneuerbarer Energien am Gesamtenergiebedarf steigt kontinuierlich an. Gleichzeitig wird Energieverbrauch von Neubauten sowie Bestandsgebäuden stetig gesenkt. Diese Trends ergeben große Potentiale für die klassische Photovoltaik und BIPV-Lösungen. 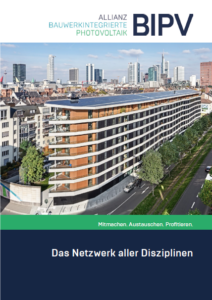 Gerade moderne Konzepte der BIPV können Teile der Gebäudehülle durch Solarmodule ersetzen und somit neben günstiger Eigenerzeugung von Energie auch architektonische Innovationen bieten. Das BIPV-Forum, das am 18. März 2019 im Kloster Banz, Bad Staffelstein stattfindet, bietet die ideale Plattform, um sich über die aktuellen Entwicklungen zu informieren und sich mit anderen Experten und Interessenten über Erfahrungen auszutauschen. Veranstalter des BIPV-Forums ist die Conexio GmbH. Die Allianz BIPV ist Partner dieser Veranstaltung. 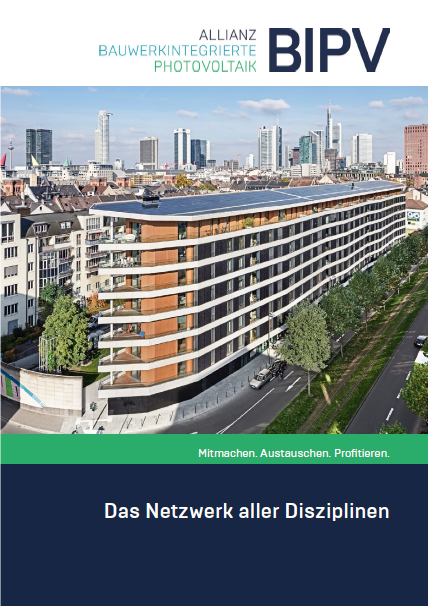 Mitglieder der Allianz BIPV erhalten bei der Buchung der Veranstaltung daher einen 10 % Partner-Rabatt auf die reguläre Teilnahmegebühr. Einzelheiten zum Partner-Rabatt finden Sie im Mitgliederportal. If you are a BIPV specialist, consultant or architect: Seac-ECN (Solar Energy Applications Center from The Netherlands) invites you to participate in this year’s Research study on PV façades. This project is part of the European Interreg project PVOpmaat, and we would like to invite you to have a 30 min. chat with us about your experience and thoughts about the usage and barriers of PV façades in the current European market. In exchange for your time, your participation will be published in this year’s report, and we can send you a digital or physical copy of it for free. More information about past projects: https://www.seac.cc/en/publications/#BIPV . 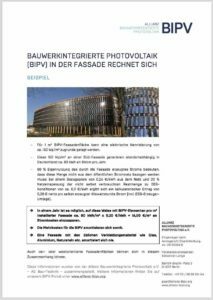 Das Info-Blatt “BIPV in der Fassade rechnet sich” zeigt anhand einer einfachen Beispielrechnung, dass BIPV auch wirtschaftlich Sinn machen kann. Building-integrated Photovolatics (BIPV) is currently an expansive market, in which Europe has the leadership in terms of installations, followed by USA. One of the main drivers for BIPV market growth in the European Union is the increasingly demanding legislation related to buildings energy performance. However, a continuous growth of the market requires compliance with strict requirements in terms of design flexibility, aesthetics, durability, cost reduction, grid integration, compliance with standards and operation & maintenance. Under the H2020 of the EU Framework for Research and Innovation Programme, a collaborative BIPV project known as PVSITES “Building-integrated photovoltaic technologies and systems for large-scale market deployment” involving a consortium of 15 European partners was launched recently. PVSITES project will demonstrate in several representative buildings throughout Europe an ambitious scope of photovoltaic technologies and systems, specially tailored to provide a robust solution to market demands in the near future. During the project lifetime, a detailed analysis of the BIPV market, the relevant stakeholders and their needs will be performed, and specific business models for the products and services implemented during the project will be developed. PVSITES will accomplish the development activities needed for the set up and monitoring in real buildings of a relevant number of photovoltaic solutions for building integration, based on the most innovative crystalline silicon (c-Si) and flexible thin film (CIGS) technologies. The project will also demonstrate novel grid connection technologies and energy management tools. In parallel, the development of a software tool for the coupled simulation of photovoltaic production and building energy performance will be addressed. Life–cycle assessment at product and installation level is another major objective of the project. The aim of the Dem4BiPV project is to develop an innovative and multidisciplinary high quality course for Building-integrated Photovoltaics (BIPV) to train the BIPV professionals of the future. The course will be implemented at the postgraduate level and will be part of a Master’s in Sustainable Energy in a number of leading universities in Europe. Dem4BiPV is based on the principle of European cooperation through which innovative educational material utilizing ICTs will emerge on the topic of BIPV, which is of crucial importance for the future development and penetration of the PV market in Europe with a potential significant contribution in meeting Europe’s energy challenges. Education and training are crucial for both economic and social progress, and aligning skills with labour market needs plays a key role in this. This project has been designed and structured so as to meet the real needs of the PV market and contributes positively to EU benchmarks for 2020 in relation to education. It also indirectly tackles fast-rising youth unemployment, as it places emphasis on delivering the right skills for employment in the BIPV industry and increasing the efficiency of higher education in the field of sustainable energy and on working collaboratively with all relevant stakeholders. Innovation (through the utilization of ICT, VLE, and remote labs), sustainability (partnership between academia, industry and other stakeholders) as well as significant impact for academic institutions, industry and other stakeholders are the main drivers of this Erasmus+ project. In unserer ersten Info-Broschüre stellen wir die Ziele der Allianz BIPV vor. 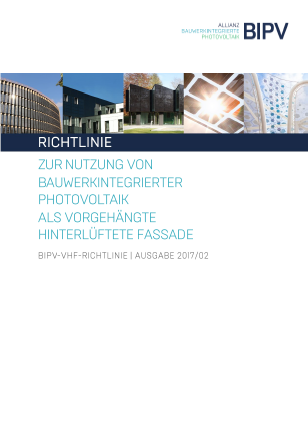 Richtlinie zur Nutzung von Bauwerkintegrierter Photovoltaik als vorgehängte hinterlüftete Fassade (Ausgabe 2017/02), erarbeitet von der AG Bau+Technik. 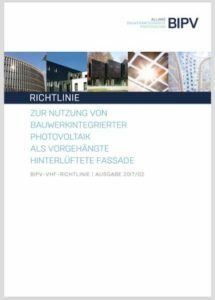 Diese Richtlinie gibt Qualitäts- und Sicherheitshinweise zur Planung und Ausführung von BIPV-Fassaden.